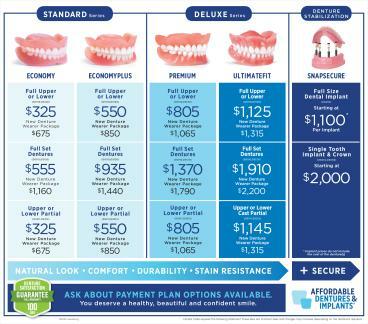 Affordable Dentures & Implants - Leesburg II, P.A. Leesburg, Florida Affordable Dentures & Implants offers several styles of full dentures, each with special features and advantages. It’s part of our mission to put transformation within reach. See below for more details, or call us at 352-508-6770 if you have a question about a particular style. When you take advantage of the dentures and implants available in Leesburg, FL, from Affordable Dentures & Implants®, you can change your life in as little as one day. Our practice is able to give patients good reasons to smile by providing a wide range of solutions at affordable fees. We believe that a commitment to continued innovation in affordability, speed, accessibility, and patient satisfaction is why we’ve been able to help thousands of patients each year. Our dentures can give you the confidence you need to smile again, and our implant treatments can help you stop bone loss in order to maintain your youthful appearance. No matter what type of service you come to our office for, we'll provide the compassionate care you deserve with dignity and respect. We take a lot of pride in improving lives. Affordable Dentures & Implants works hard to match patients throughout Leesburg, Silver Lake, Eustis, Yalaha, Wildwood, Belleview, Lisbon, Tavares, Groveland, and the surrounding areas with long-lasting dentures and implants. While our practice is locally operated, we're supported with the resources of America's largest denture provider. We're open Monday through Friday. Please give our practice a call today to set up a consultation at your convenience. Dr. Agnini earned his Doctor or Dental Surgery degree at University of Maryland School of Dentistry. Please fill out the form below to request an appointment. For immediate assistance, please call us at 352-508-6770.